Fulfilling orders in an accurate, efficient, and time-effective fashion. Keeping precise, up-to-date records on inventory. Developing a system to replenish inventory effectively. Managing returns in a cost-efficient yet customer-friendly way. Storing customer information safely and utilizing that information effectively. Collecting payments, paying invoices, and keeping accurate financial records. Managing relationships with distributors, warehouses, eCommerce platforms, etc. Integrating NetSuite with your eCommerce platform can help manage and streamline important processes like order fulfillment, supply chain management, billing, and so much more. Below you will find more information about how NetSuite connectors work, how NetSuite can improve your e-commerce processes, and how NetSuite can help you accelerate your company’s growth. NetSuite is one of the world’s top cloud-based ERP solutions on the market today, and thousands of companies depend on it to run mission-critical functions for their business – all of which is processed globally in the cloud. At its core, NetSuite is designed for growing modern companies that require a streamlined, single-platform approach to e-commerce to improve how they do business. From allocating funds to managing customer experience — NetSuite can help in diverse areas your business. Because it is mobile-enabled and cloud-based, NetSuite can be accessed easily whenever, wherever, freeing you and your team from time-consuming and repetitive processes. Why not devote your time to expanding and improving your company, rather than spending hours on rote management tasks? Support for businesses dealing in 190 different currencies, making international bookkeeping a little less daunting. Offers interface in 20 different languages, allowing you to collaborate remotely with employees from around the globe. Automates tax compliance in over 100 countries to help businesses expand and reach new markets without stressing about local compliance. In short, what this all means for you is that businesses on any scale (local, national, and even global) are able to easily communicate with their partners to ensure proper handling of product, data, and profits. But ease of use and a broad reach is far from all that NetSuite has to offer your business. This built-in flexibility also extends to how information is processed, shared, and stored. If desired, NetSuite can populate a single chart of accounts across subsidiaries. However, should the situation call for it, NetSuite can also complete the inverse function, creating segmented breakdowns of exactly how each branch of your business is performing and what needs exist where. This kind of comprehensive ERP system means helping businesses accelerate and streamline all financial processes in real time, even if managing multiple subsidiaries and/or selling across multiple channels. In addition to simple and flexible financial management, NetSuite helps with the minute details that matter so much in business. NetSuite can synchronize customers, products, orders, and more across multiple marketplaces, and between various systems. This means that all information regarding orders, payment, fulfillment, and more remains consistent, up to date, and easily shared between your business, online marketplaces, fulfillment vendors, and beyond. In essence, NetSuite is able to fully integrate with all systems, and put all information into one place, making e-commerce management easy and more efficient, and ensure all order, fulfillment, inventory, and pricing information is always current and up to date. The ability to sync data across channels is one that can improve every aspect of a business. Customer syncing abilities through NetSuite allows you to sync your database of customer information across platforms (Amazon, eBay, Jet etc), and improve the overall customer experience. Stock syncing ensures inventory is always updated, and quantities from a variety of warehouses are compiled to give an accurate depiction of true inventory quantities. Item syncing through NetSuite sends surplus or finished stock information to multiple channels, again making sure information on inventory is always accurate. In addition to syncing of information are electronic data interchange capabilities within NetSuite. With this feature, you are able to build a B2B trading partner network at a fraction of the cost/time of traditional EDI solutions. This feature offers you a central location wherein to view and manage data transformations, workflow integration, transaction monitoring, and more. One of the truly exciting features of NetSuite is the ability to integrate seamlessly with extremely popular and high-traffic e-commerce marketplaces, including Amazon, eBay, Walmart, Jet, Google, Sears, and over 100, which can vastly improve sales and profit margins for your company. NetSuite will help you here too, with automatic invoice generation, and even refund and cancellation management. With access to both in-house fulfillment and third-party logistics providers, even shipping and handling becomes easier with NetSuite. This feature also gives you the ability to automatically notify customers with their tracking numbers and carrier details once their order has been picked, packed, and shipped. NetSuite may be one of the most powerful ERP solutions on the market, but without an automatic integration into your marketplace it can actually be fairly time consuming. Without an automatic connector, users are forced to input their own data, increasing the risk of possible human error, and increasing how much time must be allocated to data entry. Additionally, the issues associated with manual data entry are as plentiful as they are difficult to overcome. Firstly, there is the issue of financing; simply training someone to input data can cost companies tons of money, and the costs of employing people to do manual data entry is even higher. Despite the high cost of manual data entry, it is almost never as accurate and reliable as automated data entry. Humans are prone to error, regardless of how much training they have had or how dedicated they are to their work. Because of the possibility for error, and the nature of manual data entry itself, it is also an incredibly time-consuming process. Both in compiling and inputting data and in checking for possible errors, manual data entry costs far more than it needs to, both in time and money. Firstly, there is the issue of financing; simply training someone to input data can cost companies tons of money, Most important is the issue of consistency. An automated data entry system will always fill out paperwork in the same way, terms will always be the same, and a general common language will be conveyed across the board. With manual data entry, misinterpretation is always a possibility. This is simply due to the flexible nature of people and the reality of different learning styles, comprehension, and languages. Integrating NetSuite with your marketplace is the answer to all the issues above. With automated data entry, real-time data syncing, and the consistency of NetSuite, you are able to save time, money, and lots of headaches. Costs are reduced by removing the need for training and employing data entry workers, time is saved by reducing human error, and misunderstandings are avoided with a common vocabulary across the board. And, the options for marketplace connectors are almost endless. With over 100 integrations offered through Mobility eCommerce, you are given incredible access to some of the best, highest traffic, and most trusted e-commerce marketplaces today. Amazon NetSuite Integration: Amazon is the most popular e-commerce marketplaces. This is due in part to the fact that it boasts an enormous (and constantly growing) number of vendors. However, many of the auxiliary companies and industries that have grown up around Amazon have helped to cement its place as the world’s number one e-Commerce platform. From the incredible networks of shipping and handling companies, to the software solutions that help it run, there are a lot of reasons to love Amazon. Because of its popularity, the ability to integrate with it means giving your customers a familiar and exceptional retail experience. Through Mobility eCommerce, you are able to fully integrate with the Amazon Fulfilled by Merchant and Fulfilled by Amazon seller options, which in turn gives NetSuite every bit of information necessary for driving your business. The Amazon NetSuite connector gives you the power to sync inventory and price information with Amazon, create FBA shipments and transfer orders, reconcile FBA shipments, track Amazon FBA stock in NetSuite, manage FBM and FBA orders, import customers or sales orders from Amazon to NetSuite, improve shipping and handling, and more. Walmart NetSuite Integration: With the Walmart NetSuite Integration, you are again able to streamline all aspects of your business. All transactions are automated, and all information (including orders, customers, inventory etc.) is seamlessly stored and moved between systems. Ebay NetSuite Connector: As with the Amazon and Walmart integrations, the Ebay NetSuite integration helps to streamline financial and e-commerce processes while saving you time and money to focus on other aspects of growing and improving your business. With full automation and automatic syncing, you are free to focus on what is most important without needing to manage the minutia of fulfillment. MobilityeCommerce offers many more integrations, including Shopify and Jet, and each and every integration helps you to improve and automate your business. The NetSuite MobilityeCommerce integrations make it easy to automate the process of duplicating product listings, keep track of inventory, and monitor fulfillment and financial details all from one easy to use platform. Accurately keeping track of cash flow and your company’s financial status is fundamental to making smart business decisions. Yet, for many e-Commerce companies, even simple accounting practices can be made difficult by the variety of software tools across which their data must be tracked. This is another challenge that can be solved by integrating NetSuite with your e-Commerce platforms. Balancing Netsuite accounts with your financial records in Amazon, Walmart, Ebay, etc. will empower your company to make better decisions about spending, inventory, and other key processes. If your current software solutions are failing to reconcile merchant accounts with your accounting platform (or are failing to account for the various fees that occur across the e-Commerce process) then you are not running your business as efficiently as possible. With the help of the Mobility eCommerce connector, you can ensure that your records are accurate, both in your marketplace platforms, and in programs such as Quickbooks, Xero, etc. Give your team the information they need to make smart decisions! What Other Problems Can Mobility eCommerce Solve? Beyond providing excellent marketplace integrations, MobilityeCommerce can help make your business the best it can be. MobilityeCommerce is committed to helping ensure financial records are accurate, and that company records always reflect the reality of charges issued by eCommerce marketplaces such as Amazon. MobilityeCommerce provides a platform for eCommerce companies to sell their products globally via eCommerce marketplaces such as Amazon, Rakuten, Overstock, and more. These MobilityeCommerce connectors give you access to a single view inventory feed and management system with which your business is able to seamlessly manage multiple eCommerce channels. Mobility eCommerce also helps you manage your relationship with e-commerce marketplaces. For instance, Mobility eCommerce can help you manage Fulfilled by Amazon (FBA) orders. With FBA services, the minute details of storing, picking, packing, shipping and tracking are handled by Amazon and their expansive network of transportation, holding, and shipping companies. This also means Amazon handles troubleshooting any issues that come about in the delivery process, your customers can take advantage of Amazon Prime, you save costs on storage and shipping, and you are able to save time and money on the customer service end of things. Getting started with a NetSuite integration can drastically improve the state of your business, and increase earnings. It should also be noted that choosing to use Mobility eCommerce doesn’t mean starting from scratch. Mobility eCommerce integrates your current business system with the new platform to ensure all information is in one place and fully accurate. This protects what you have already accomplished while helping you to increase the value of your business through market growth, automated time-saving functions, and more. 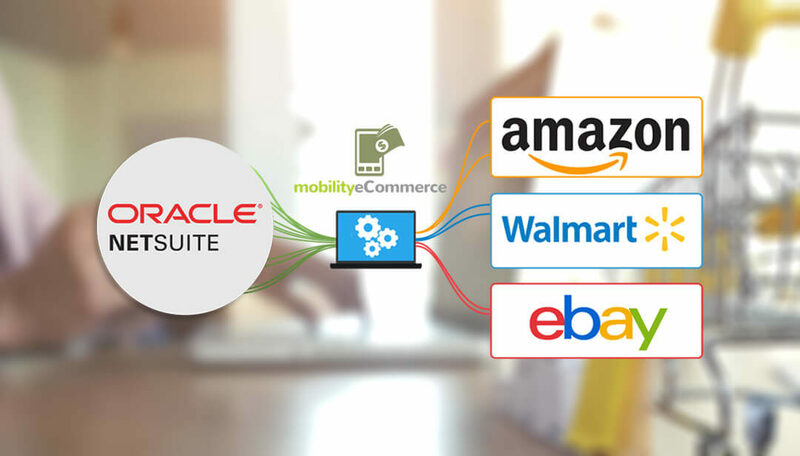 If you are interested in learning more about how Mobility eCommerce and our NetSuite integrations can improve your business and help you run the financial and shipping side of things more smoothly, visit us online, get in touch, and browse more of our e-commerce connector options. We offer integrations for e-commerce marketplaces in North America and Europe and can help you with everything from data syncing to invoicing to managing your stock levels. Our team of e-commerce experts can get your marketplace integration up and running quickly and efficiently so you can start growing your business today!